The Hydrozonix ozone-based system is highly effective at killing bacteria in produced and fresh water. The system treats 100 barrels of water per minute and can handle wide variations in influent water quality. The use of a strong oxidizer in ozone makes it a superior bacterial disinfection system. The focus on mass transfer/mixing allows for better use of the ozone created, which leads to its exceptional performance. Bacteria cannot build a resistance to ozone like it can with other non-oxidizing biocides. 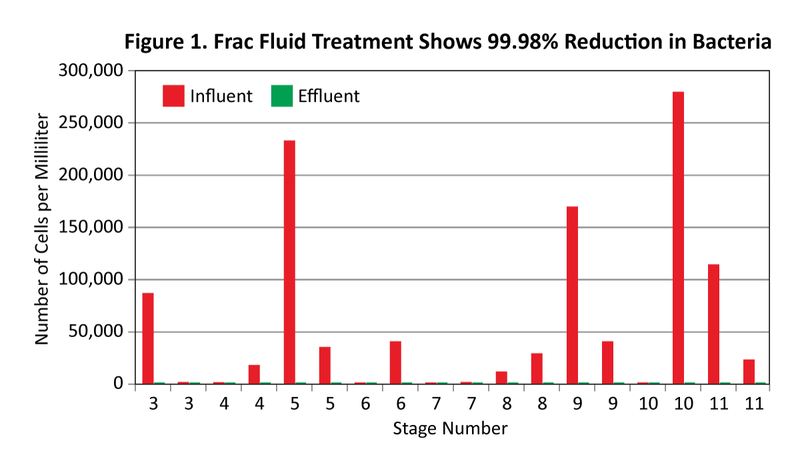 Because of their long half-life, other oxidizers can lead to compatibility problems, making ozone an ideal oxidizer for bacterial disinfection in the oilfield. 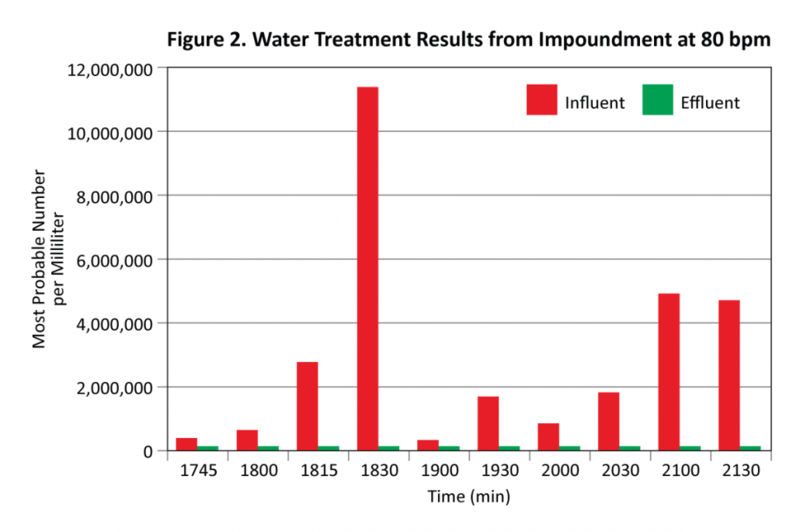 In Figure 1, real-time testing and real-time sensors monitoring system performance show that the ozone-based treatment removed 99.98% of bacteria present in the influent water. 100% removal has also been achieved but is rarely necessary. Figure 2 shows results of the ozone system during several hours of treating water from an impoundment at 80 bpm. More than 99% of bacteria was removed. Ozone, as a strong oxidizer, provides strong bacterial disinfection.